History: I have a 24 year career in hospitality working in some amazing award winning restaurants from Perth, Melbourne and Townsville. Shortly after completing my apprenticeship I became a Sous Chef at one of Perth busiest and most successful restaurants Coco’s Riverside Restaurant. After 3 years in this position I decided to head to Melbourne to grow my culinary knowledge and passion. Working in Melbourne for 7 years at some amazing venues, while at Donavon’s Restaurant. A move to a venue called Young and Jacksons enabled me to take on a role as Head Chef for the first time, while in this position the venue won numerous awards, the hotel was sold in 2004 and it was then a time to move on .Time for a warmer environment and to be closer to family, I was offered the opportunity to come to Townsville to assist with the setup and to be the Executive Chef at a new venue called The Watermark in 2004. The Watermark was awarded A Star rating in the Good Food Guide, the first restaurant in the city to be recognised for this award. In 2010 with business partners we purchased a very run down restaurant and transformed it into Jam Corner. 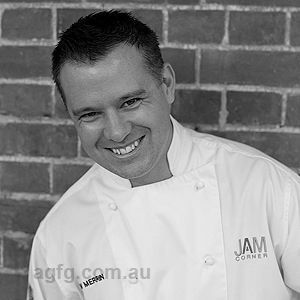 2012 Jam corner was awarded a Chef Hat in the Australian Good Food Guide. 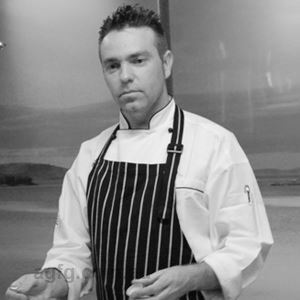 My passion is to grow the food scene in Townsville, I have been involved with a dinner called Australian Festival Chamber Music ‘Chef’s in the North Dinner’. Each year we bring up leading chefs from all over the country and match them up with our local chefs to create a 5 course degustation dinner with great wines and international musicians to create a spectacular dinner waterfront with the Magnetic Island as a backdrop. Another local event BMW Sensation Food and Wine Festival is held in September on a bridge connecting Palmer Street (Food Street of Townsville) to the CBD, As the Executive chef for the dinner we create together, with 4 leading Townsville restaurants, a 5 course degustation dinner under the stars over the water and with the city lights as a perfect backdrop. The following day there is a food and wine festival on the Sunday afternoon. My two choices for a career growing up 1-Chef or 2- Accountant. The best choice was made to become a chef and strangely enough my partner of 11 years is an accountant. I love the industry, I surround myself with great produce, I get to meet amazing people and share some stunning wine in the process. Living in a tropical location like Townsville is perfect to showcase the food style I love to cook- Modern Australian with an Asian influence. The clean defined flavours are perfect for our climate and lifestyle, Townsville has over 300 fine days a year. Team work- we are all in it together, we all need each other to make it successful. 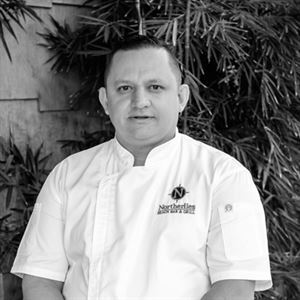 Mark Diels from my beginning has been a big inspiration to ensure not only quality food and produce is important, being able to manage the kitchen and the business is crucial to the sustainability of the restaurant. Neil Perry is an amazing chef who has put a lot of great Australian cuisine on the world map; I love his versatility and flavours. Being surrounded by great food, wine and a fantastic customer base who feel more like family and friends, it has to be the best job in the world. The industry is always evolving and changing, one key element for me is not forgetting the importance of quality produce and ensuring our guests leave happy. Western Plains Pork, I have been buying this amazing product for over 15 years now direct from the farm, I fly the produce up from Melbourne it's that good. WPP only raise female pigs- naturally sweeter and only to 60kg to ensure they are succulent in a free range environment. At a luncheon in Melbourne one of the dishes I created was a pig heart Carpaccio, the dish was talked about for a long time. Fortunately the luncheon was for chefs and industry. One of the signature dishes on the menu we create is for our functions; we serve a whole suckling pigs upstairs overlooking the CBD and river with one of my chefs carving it in front of the guests. Served with little steamed buns and array of condiments. Effortlessly combining style with innovation, JAM continues to make its mark on Townsville's dynamic restaurant scene. A well-loved riverfront crowd pleaser, this versatile venue constantly buzzes with the steady hum of diners popping by to wine and dine in the elegant space furnished with wide mirrors, soft lighting and intimate dining booths. JAM’s seasonal menu presents breakfasts such as apple crumble pancake with warm caramel sauce and cinnamon ice cream, as well as lunch and dinner options like local barramundi, grilled or battered with chips and yuzu aioli. 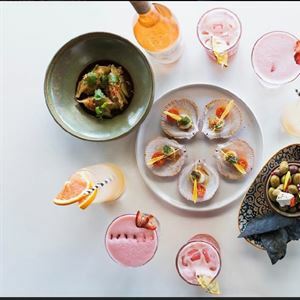 Herbivores are also well-catered for with an extensive vegetarian menu, while JAM’s awarded wine list offers more than 100 choices from small Australian producers to international champagnes and wines.